The talented New York Choro Ensemble helped showcase LP’s exclusive line of Brazilian percussion, made by RMV at a recent recording session at the LP® studio. 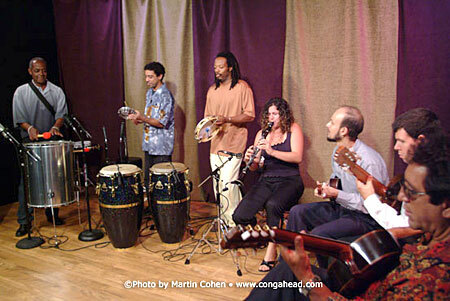 The talented group of musicians, which includes Pedro Ramos, Cavaquinho; Anat Cohen, clarinet; Carlinhos Almeida, guitar; Gustavo Dantas, guitar; Ze Mauricio, percussion; Jorge Amorim, percussion; and Jorge Silva, percussion and dance routine; performed the Pixaquinha tune, Um a Zero, which also appears on the Yo-Yo Ma recording Obrigado Brazil. To hear MUSIC from this event please click: Track 1.